The time has come to make an upgrade in your RV. 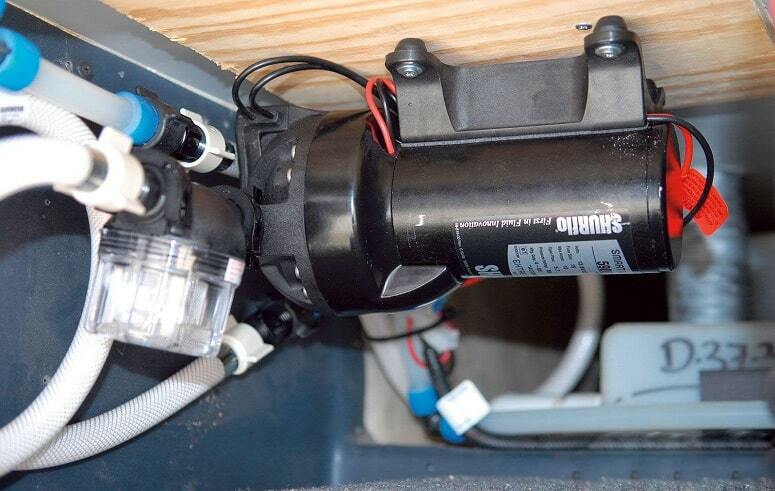 Every pipe and faucet depends on the water pump, allowing freshwater to flow from the reservoir throughout your RV. Installation is simple, and most water pumps are fairly simplistic systems that don’t require much intervention. 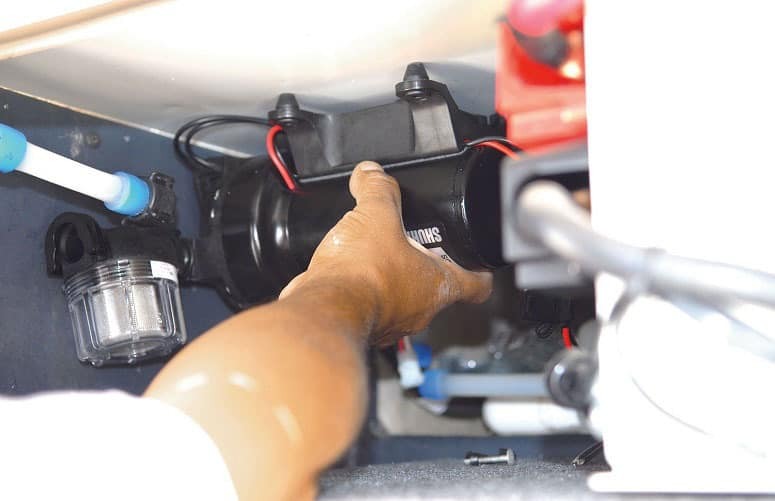 Even so, we’ve gone over the top maintenance issues and solutions you run into with an RV water pump, discussed pressure to its fullest lengths, and showcased the top five RV water pumps for you to upgrade your RV as soon as possible. Why Do You Need Water Pumps? How Much Power Do RV Pumps Take To Drain? Shurflo is one of the first names you’ll hear when it comes to RV water pumps. This simple, inexpensive unit caught our eye for its reputation. You can pump 3.50 gallons of water per minute, while simultaneously enjoying the sound of silence, because this baby runs very quietly. This has similar properties to the other four we’ve chosen, so why the hype over Shurflo? This pump self primes, eliminating an entire step for you. Shurflo made this small, compact, and utterly powerful for the money you’re spending. Apart from all that, Shurflo also threw in a one-year warranty, and two years of customer support. In some cases, depending on manufacturer mishaps, you might be able to extend that warranty up to two years. The Revolution is taken down a notch from the fresh water pump, but still provides up to 3 gallons-per-minute and a simple installation process. 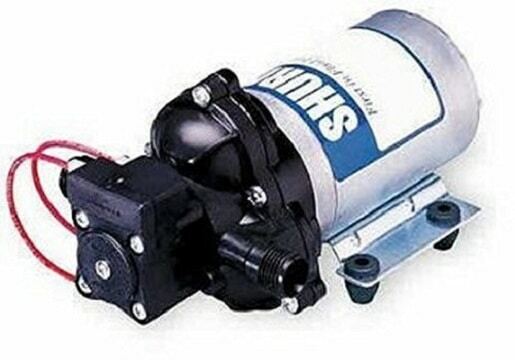 Shurflo makes their water pumps a DIY dream come true, especially with the self-priming function. What makes this such a star water pump is the low energy usage. Even if you have to empty your entire freshwater tank, you’re only running it on 7.5 amps through your 12V DC outlet. Your pump can also run dry, and thanks to the small construction, maintenance issues (which we’ve gone over in the guide below) are extremely easy to locate. Shurflo gets confusing when it comes to their warranties. Though this product is cheaper than their 3.50 gallon pump, it comes with a full two-year warranty, and outstanding customer support, while their other products receive a one-year warranty. Take advantage of this inexpensive upgrade for your RV. 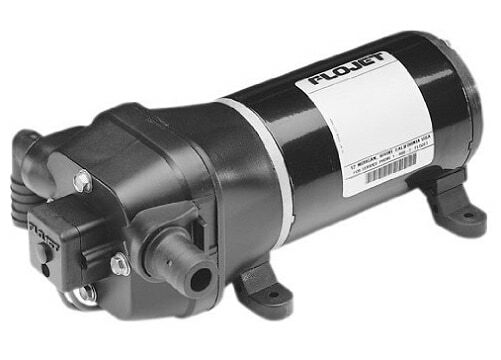 Flojet promises a much quieter operation, while being one of the most simplistic water pumps you’ll ever install. Simple port plugs allow you to pop this in, spend about ten seconds of your time, and you’ll be on your way to enjoying this whisper-quiet water pump in no time. As with other models on this list, this self primes to take an extra step out of your to-do list. Pump 3.30 gallons of water through the quadruple piston interior, which helps to maintain proper pressure even if one of those pistons fail. If your water pump starts to die, having three legs to stand on will last until you can get home from your trip and fix the issue. Last but not least, while it sits at a medium price range, it mimics the energy-saving low-amp usage of higher end models. Between you and Flojet, your RV will be running smoothly and efficiently. Save water, save energy, and optimize your time in the RV. Perhaps you’re packing half-a-dozen passengers, or you just want to deck out your RV in the best water pump imaginable. Eteyo is the premium option for those of you who don’t want to compromise on power, and you won’t even have to inflate your budget to acquire it. Eteyo made this model corrosion-resistant. It isn’t just a coating, it’s a material treatment, so it’ll last for years after you’ve first installed your unit. This helps keep your water clean and your pump operating effectively, reducing maintenance issues for the foreseeable future. 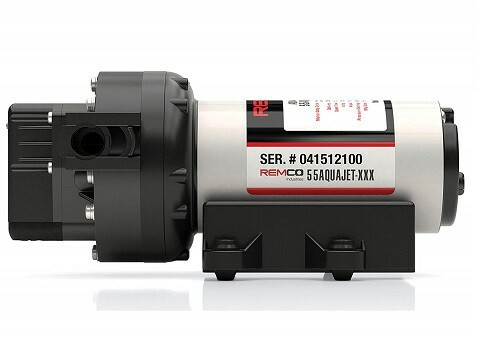 Because this is designed to work with yachts and high-level food service demands, this versatile pump could run for hours without dropping a single psi. Eteyo includes a generous warranty with your purchase, and utilizes the standard 10 amps of power that most high-capacity water pumps do. Last but not least on our list, Remco created a brilliant rendition of what a powerful RV water pump should look like, and how it should behave. They created this corrosion-resistant motor housing to protect the 5.30 gallon pump from harm and the test of time. That motor has an automatic psi adjustment setting, which reacts to how you turn the valves. You’ll be running your RV water pump at the most efficient levels, even without trying. That not only saves you electricity, but also means fewer stops to refill the fresh water tank. With a five-valve motor, at full capacity this will use up 10 amps of power if run continuously. If running on a more economic setting, this can pump up to 3.50 gallons without putting too much pressure on delicate water filtration systems. From troubleshooting and repairs to water pressure and more, we’ve covered everything you need to know about your water pump from top to bottom. They’re a fairly straightforward to install and manage, once you get your hands dirty. Without further ado, let’s hop into it. 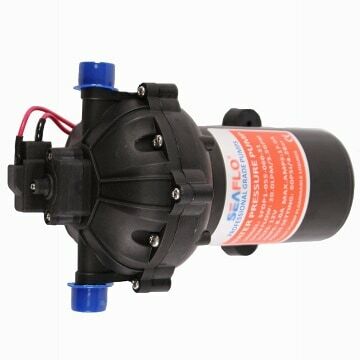 Your water pump dictates the flow of water throughout your entire system. Water pumps generally last a long time, which is why you’ll see many inquiries online about purchases regarding older mobile homes. You can have it last for ten or fifteen years, even if you’re a full-time RVer. You always need a water pump, but as life takes you by the hand and you end up with more and more passengers in your RV, you need a higher capacity. Water pumps have a GPM, or gallon-per-minute rating that dictates how much water comes out of your system. Whether you need to empty your system to replace a fresh water tank or you simply want more efficient showers, your water pump is the MVP. Water pumps dictate the pressure, more or less. They’re essentially the check and balance system for your water, keeping you from exerting too much water pressure, and optimizing flow to lower water waste. Your pump pushes water into the heater, into the pipes for cold water, and of course, handles everything that’s currently trapped in your pipes. You can find out how much power it takes by determining the capacity it has, your RV water heater capacity, and accounting for roughly one to three gallons of water in your pipes. Multiple the gallons by the amp usage, and the gallons-per-minute rating on your RV water pump. Using the amp power rating, determine how many gallons of water it can pump per hour, divide it by how much water you’re going to be dumping (be sure to include the total number of your fresh water reservoir), and you’ll find your answer. We would like to provide a simplistic way to tell, but since different units use different power levels and pump different volumes of water, it needs to be done by your calculations. While your water pump is one of the most crucial components of your RV, you’re going to encounter tons of problems along the way. 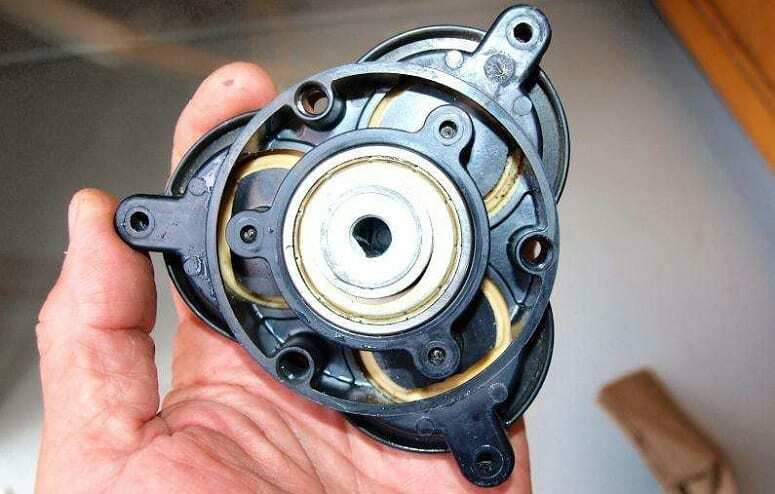 Your water pump isn’t the most expensive aspect of your RV’s inner workings, but that doesn’t mean you need to purchase another one when it’s on the fritz. The water pump undergoes plenty of stress, which is why we’ve answered some of the most common problems, and how to fix them. Regardless of how much you spend on an RV water pump, you’re going to encounter issues while using it. It’s part of the RV journey. That’s why we wanted to address the most common issues, and how to fix them without having to redeem your warranty, or undergo an expensive repair or replacement by a professional. This is one of those issues no RV owner ever wants to encounter. You could have blown a fuse, or the pump motor could have just died. It really is a 50/50 gamble on this one. You can check by flicking the master switch and charging the battery. Otherwise, we are very sorry for the loss of your RV water pump motor. The most likely culprit of this common issue is a low water level in your tank, or clogged water lines. You can fix this quickly by refilling your tank and then running the water straight through. This would obviously be ideal to handle at an RV stop station or at home before you head off on your excursion. In rare circumstances, you might need to replace the clean valve, check the wiring on the pump, or replace the belt. Whether it’s a faucet or a water line, your pump is slowly being tricked into thinking that the water is running, when in fact nothing is happening. You might have to replace the faucet sets or valves, but you should also check out the pressure switch. You might not be getting enough pressure from the pump, at no fault of the pump itself. During your installation, you came across the intake line. There could be a kink in the hose preventing proper flow, forcing water to back up into your pump and pressure to build. That can also be part of the next issue, being loose bolts and a shaky housing for the motor. You can fix this by inspecting the unit, ensuring the hose is properly laid out, and tightening all your hardware to keep the pump in place. So long as it’s functioning as it should, tightening everything should do the trick. We’re always trying to create the most efficient RV possible. You’ve no doubt spent hours upon hours finding more ways to conserve energy, water, and prolong the life of your RV’s internal components. One way to get the most out of your water pump is to monitor the maximum gallon use per day. There’s rarely some stamp on a water pump that showcases exactly how many gallons it can pump through it in one lifecycle. What we know from common sense is that the more you use something, the faster it deteriorates, until it eventually breaks. Your water pump is designed to withstands thousands, possible tens of thousands of gallons running through it. Find out your average gallon usage per day, and strive to minimize it. Despite getting an upgrade on your water pump, mitigating your daily water use is a surefire way to lengthen its life expectancy. One-Gallon Shower: One open secret is to take one-gallon showers, and not a drop more. It’s a controversial topic for RV owners, because if you only took a one-gallon shower at home, it would feel like you were barely rained on. Apply soaps and shampoos before you step into the shower, use one cup of hot water to begin cleaning yourself, and then hop in to use the rest of that gallon in the shower. It’s not the most pleasant experience, but it will lower your water use. Bring Body Wipes: Mitigate water use with in-between baths, using body wipes. Not baby wipes, not dime-store moist towelettes, get something like Paper Shower that’s designed for RVers. You can also save water by using biodegradable soaps. Cold Flow Collection: Just like at home, when you kick on the hot water, you get that initial cold water flow. Save that in a pitcher to purify for drinking water (so you don’t use the tap), or save it to use for dishes later on. You can save an average of twenty-seven gallons of water from cold flow per year, if you RV full-time. You increase pressure without using more water, effectively reaching your RV’s needed psi, and holding onto extra gallons throughout the year. Last but not least, upgrading your water pump to a more energy-efficient system. You should already have a water pressure regulator. If not, one may have come with your water pump, or you can make a separate purchase. Water pressure is going to dictate everything that goes on in your RV: the sink, shower, even the pressure of the toilet flushing (if it’s integrated). Your water pressure should be about 60 psi if you have a 2009 or newer RV model. This was when newer base systems were introduced with slightly narrower pipes, though they require higher pressure than older RVs to run efficiently. If you have an older RV, you should have no more than 50 psi. Older systems have less pipes running, and 60 psi could blow the system. Your water pressure is partially going to depend on how many gallons per minute your water pump is able to handle. Putting your water pump through its paces can cause long-term damage, so it’s best to grab one with enough capacity to handle your family size. Plan ahead, and you’ll get extended use out of it.